Today's Lew Landers film was WITHOUT ORDERS (1936), a highly diverting aviation film which includes a delightful line of dialogue, "We can't allow a homicidal maniac to pilot passenger planes!" WITHOUT ORDERS, a 64-minute RKO programmer, paved the way for later films such as JULIE (1956) and AIRPORT 1975 (1974), with a plucky stewardess landing a passenger plane -- in a blizzard, no less! Sally Eilers (MADE ON BROADWAY, CORONER CREEK) plays Kay, the air hostess. Prior to landing the plane she is romantically torn between two pilots, responsible Wad Madison (Robert Armstrong) and wastrel Len Kendrick (Vinton Hayworth, billed with the name Haworth in last night's NIGHT WAITRESS). Kay's sister Penny (Frances Sage) learns the hard way that Len is no good, but Kay is much slower to catch on. Unlike later aviation disaster films, WITHOUT ORDERS takes a few steps to make Kay's ability to fly the plane a bit more believable. Wad's been teaching Kay to fly a private plane, and when he lands the passenger plane they make a verbal game of her giving him the landing instructions over his shoulder, with him critiquing her orders. Armstrong, who was 18 years older than his leading lady, doesn't really do much for me as a leading man, but he's adequate. Hayworth makes a very slimy villain, with Charley Grapewin playing his too-tolerant father, the owner of Amalgamated Airlines. (Love that name!) Ward Bond is a friendly copilot who becomes incapacitated during the movie's final flight. Alan Curtis of PHANTOM LADY (1944) can be spotted in one scene as Armstrong's copilot. The little girl whose family asks Wad about the delayed plane is Helen Westcott, whose father, actor Gordon Westcott, had died the previous year in a polo accident. As an adult, Helen would star in films such as THE GUNFIGHTER (1950). 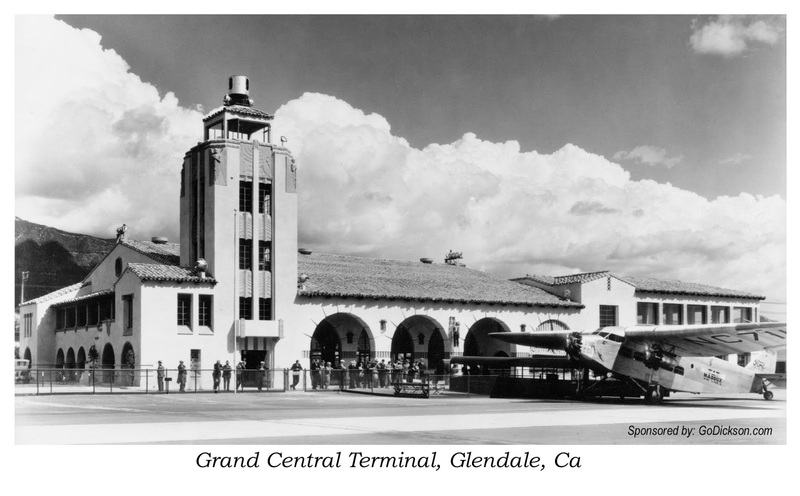 Like Landers' later SKY GIANT (1938), WITHOUT ORDERS was filmed at Glendale Central Airport in Glendale, California. The curved arches at the front of the terminal make it easy to distinguish. AIR HOSTESS (1933) is one of several other films shot at the terminal. I love the poster art for Landers films such as WITHOUT ORDERS, FLIGHT FROM GLORY (1937), and TWELVE CROWDED HOURS (1939). The colorful graphics almost look like old paperback book covers -- and I suppose some would say these programmers are the movie equivalent! WITHOUT ORDERS may not be a classic film, but it's a fast-paced hour of entertainment which I enjoyed very much. 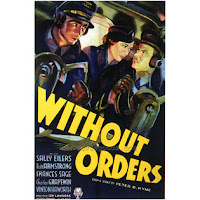 WITHOUT ORDERS is not out on DVD or VHS. It has been shown on Turner Classic Movies. Films directed by Lew Landers which have previously been reviewed at this site: NIGHT WAITRESS (1936), FLIGHT FROM GLORY (1937), THE MAN WHO FOUND HIMSELF (1937), DOUBLE DANGER (1938), SKY GIANT (1938), SMASHING THE RACKETS (1938), TWELVE CROWDED HOURS (1939), STAND BY ALL NETWORKS (1942), and THUNDER MOUNTAIN (1947). February 2019 Update: WITHOUT ORDERS is now available on DVD from the Warner Archive. My review of the DVD may be read here.